When most of us think about fall recipes, we either thing apple recipes or pumpkin recipes. For me, it tends to be both. I just can’t think of anything related to fall without thinking of picking apples and carving pumpkins; especially in the Texas heat where fall doesn’t really exist. That’s why I love this apple cinnamon muffin recipe. It’s simple enough to make that I can make it all year long; basically anytime I’m wishing it was fall! Plus, since Texas’ main crop is the pecan, we’ve added a pecan crunch topping recipe to go along with them! They’re so easy and tasty, you’ll wonder how your recipe book ever made it without them! 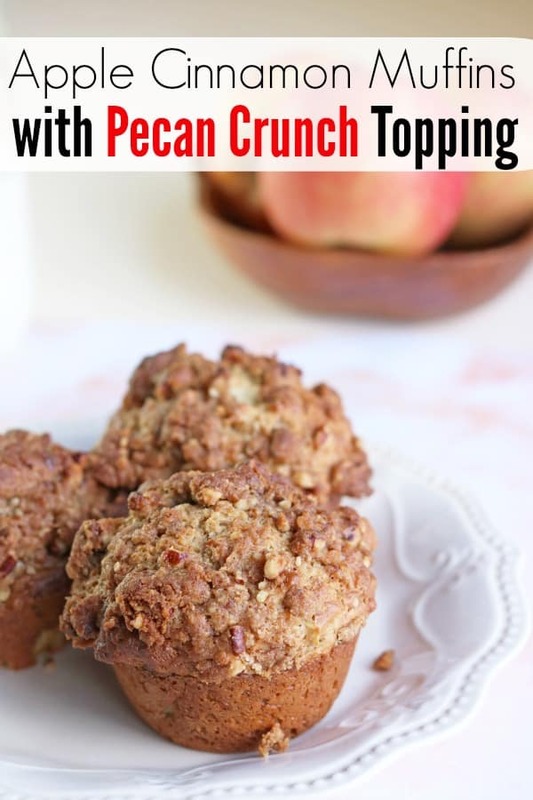 These apple cinnamon muffins with pecan crunch topping are the perfect after school snack recipe and are perfect as a make ahead breakfast recipe. If you are looking for freezer cooking recipes, these fit the bill! Just make as stated, wrap in plastic wrap and freeze until you’re ready to use them. Thaw fully and enjoy! 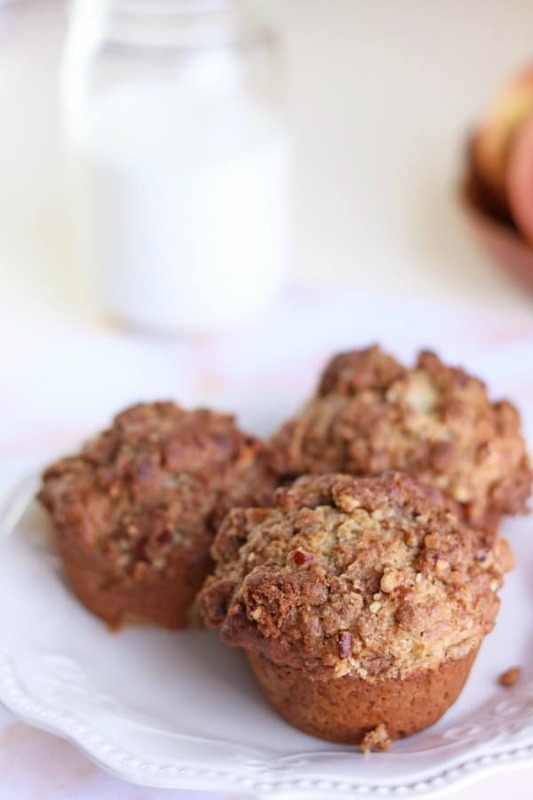 These are amazing cold, but if you’re looking for a real treat, try serving your apple cinnamon muffins while they’re warm. They’re super special that way and I’m sure you’ll love them. I really can’t say enough about them but then again, they really are one of my favorite quick bread recipes! They rank right up there with my banana nut muffins and my chocolate chip quick bread recipe in my eyes! To start, preheat your oven to 400° F and prepare a muffin tin with cupcake liners or by greasing it well. Then, in a large mixing bowl, add the flour, both sugars, baking powder, baking soda, cinnamon and salt and use a wire whisk to combine the dry ingredients thoroughly. In a separate medium mixing bowl, combine the greek yogurt, butter and eggs. Beat with an hand mixer until they’re combined. Once the wet ingredients are mixed well, add them to the dry ingredients and beat again until they’re fully mixed together. Add the apples and fold in gently using a rubber spatula. Add the prepared apple cinnamon muffin batter to your muffin tin making sure to fill each cup 2/3 full of batter. To make the pecan crunch topping recipe, combine all topping ingredients in a medium mixing bowl. Once they’re combined, work the butter into the mixture until it has a crumbly consistency. You can either use your hands for this or a fork. Spread the crumbled pecan crunch topping over the muffins and bake for 16-18 minutes. They’re done baking when the topping is just beginning to brown. 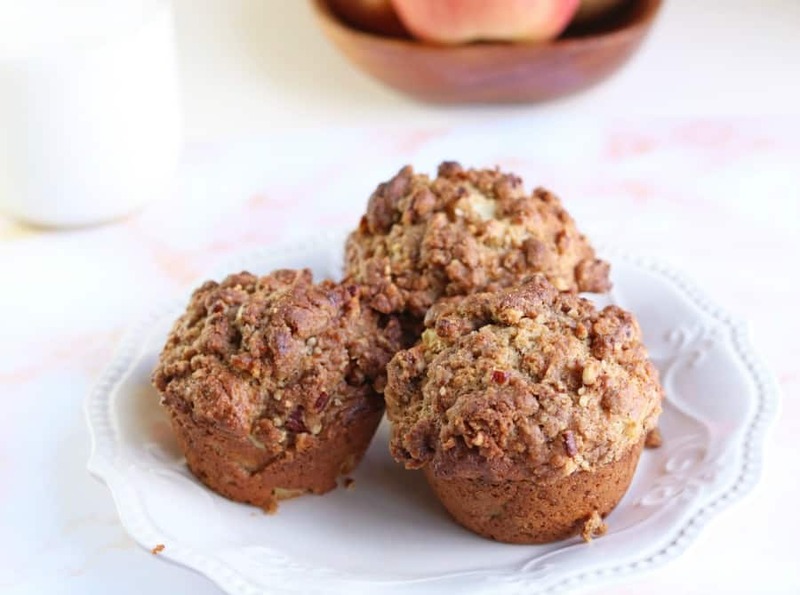 Serve warm or allow your apple cinnamon muffin recipe to cool and enjoy! If you’re ot freezing them, store them in an airtight food storage container and consume within a week. 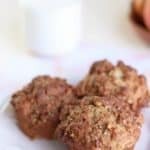 Apple Cinnamon Muffin Recipe - Bring a taste of fall to your table with these amazing apple cinnamon muffins! They're moist, perfectly sweetened and topped with our delicious pecan crunch topping recipe! 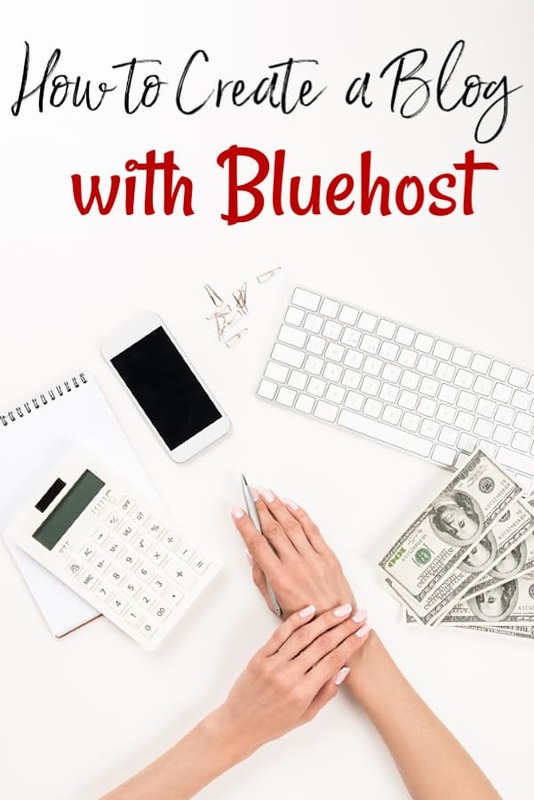 Prepare a muffin tin with liners or by greasing. In a large bowl, add flour, sugars, baking powder, baking soda, cinnamon, and salt. Whisk until thoroughly combined. In a separate bowl, add yogurt, butter, and eggs. Beat until combined. Add yogurt mixture to dry ingredients and mix gently until combined. Add apples and fold in gently. For the topping add all ingredients together in a bowl. Either work butter in with your hands, or with a fork. Add muffin batter top prepared muffin tin, filling each cup just over 2/3 of the way full.